(Source Audi ) New dimensions in driving dynamics combined with innovative ideas and concepts – and, in addition, exciting lines and a level of equipment living up to even the highest luxury performance standards: The new Audi RS 4 combines the latest high-performance motoring qualities offered by quattro GmbH in a thoroughbred sports saloon with supreme everyday driving qualities in the premium segment. Indeed, the new RS 4 is the top-of-the-range model in the A4 series, a development all-new from the ground up. Acceleration 0-62 mph 4.8 sec. Audi has chosen its trendsetting and groundbreaking FSI technology for the RS 4 saloon, direct gasoline injection ensuring even more effective combustion of the fuel/air mixture and, as a result, an even better power yield. This is matched by the highly responsive development of power, the RS 4 accelerating to 100 km/h in 4.8 seconds and reaching 200 km/h in 16.6 seconds. Top speed is cut off electronically at 250 km/h. The newly designed rear air dam encompassing two extra-large tailpipes as well as the discreet but highly effective spoiler integrated in the luggage compartment lid and the rear side panels all bear clear testimony to the saloon’s dynamic driving potential also in terms of their looks. Compared with the Audi A4, the entire body of the car has been lowered by 30 millimeters. And at the same time the development engineers at quattro GmbH have widened the car’s track both front and rear. At the end of the day, however, all these modifications to the body of the car are significant not only in terms of design, but also above all in terms of function. Driving the Audi RS 4 means driving a sports car without making any concessions. 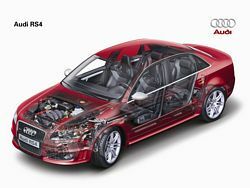 Right from the start, therefore, the RS 4 comes with virtually all the features already boasted by the Audi A4. Apart from a wide range of advanced safety components, this also means high-comfort automatic air conditioning, central locking with remote control, and electric window lifts at the front.